Cherry trees can be incredibly hard to raise, as I’m learning over the years. We originally planted four Northstar cherry trees on our property. The description of the tree seemed perfect—it only grows 6′ to 10′ tall, produces copious amounts of tart cherries, and is quite hardy. Unfortunately, it also has an open structure that Yellow Bellied Sap Suckers find absolutely irresistible (yes, they really do exist). We ended up with neat rows of little holes in the trunk of each of the cherry trees. Because the birds alternated between the wild cherries in our woods and our cherry trees, our Northstar cherries eventually ended up with a disease called bacterial canker. The sappy ooze emitted by the wounds attracted all sorts of other pests. Eventually, the bacterial canker girdled the trunk and killed our Northstar cherries (well, all except one that simply refuses to die, so we let it stay there, but it has yet to produce cherries and it never has grown more than a few feet tall). We decided to try again with a cherry that the Yellow Bellied Sap Sucker might find less inviting. This time we chose the Mesabi cherry and planted four more trees. The tight branch structure did keep the birds at bay. In fact, the trees produced 53½ pounds of cherries in 2009. However, late last year we noticed that the leaves were turning yellow in mid-summer and that the fruit yield was very low. This year we won’t receive any fruit from our cherries because they’re essentially dead, as shown here. There are still some leaves on this tree, but it isn’t nearly as full as it should be and it won’t recover. All four trees have a virus they received from an insect (type unknown). There are a number of indicators. The most noticeable is that the tree has almost no leaves, yet, there isn’t anything obviously wrong such as bacterial canker. The leaves the trees do have are yellowish with darker green around the veins, as if the leaves aren’t receiving enough nourishment. A more telling symptom is something called flux. The tree is leaking small amounts of sap (not the copious amounts as with bacterial canker). 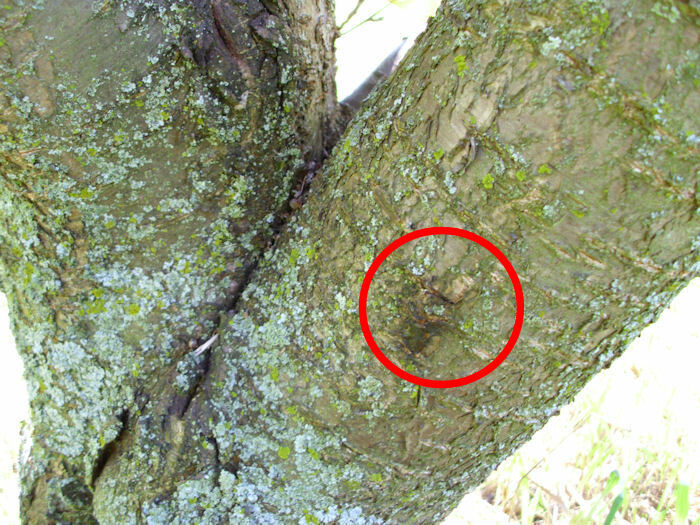 This sap is turning black as bacteria attacks it as shown here. That blackish spot (circled in red) would be very easy to miss. (Each tree has many of these little black spots.) In fact, I didn’t know what I was looking at. A master gardener friend of mine pointed it out. The ants don’t miss opportunities like this though. The trees are loaded with them—all looking for a free meal of sap. The trees are actually dying from the inside out. 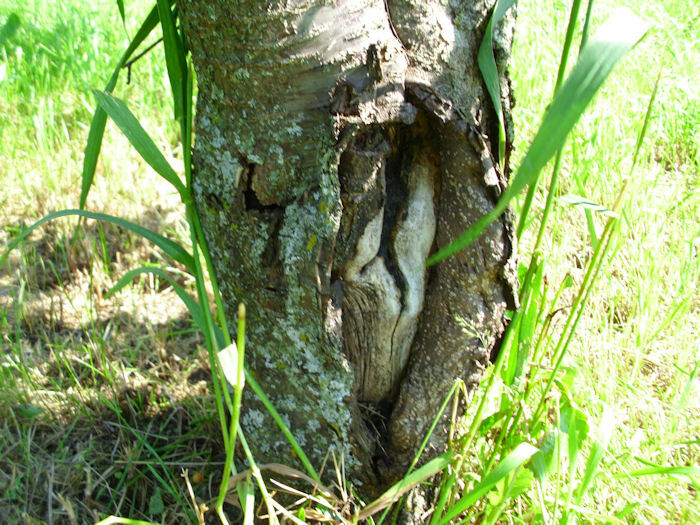 There is a wound on one of the trees where you can see the inside of the tree literally rotting as shown here. Notice how the edge of the wound has lifted up—it isn’t curled tight against the wood of the tree. This indicates that the tree is trying to heal itself, but that the new growth has nothing to stick to. The new growth should be tight against the wood. I’ll be cutting the four trees down sometime soon, drying the wood out, and using it to smoke various meats. It would be a shame to use such nice wood in the wood stove. The trees definitely won’t go to waste. Unfortunately, I can’t plant new cherry trees in the same spot (or in the location where the other cherry trees were). 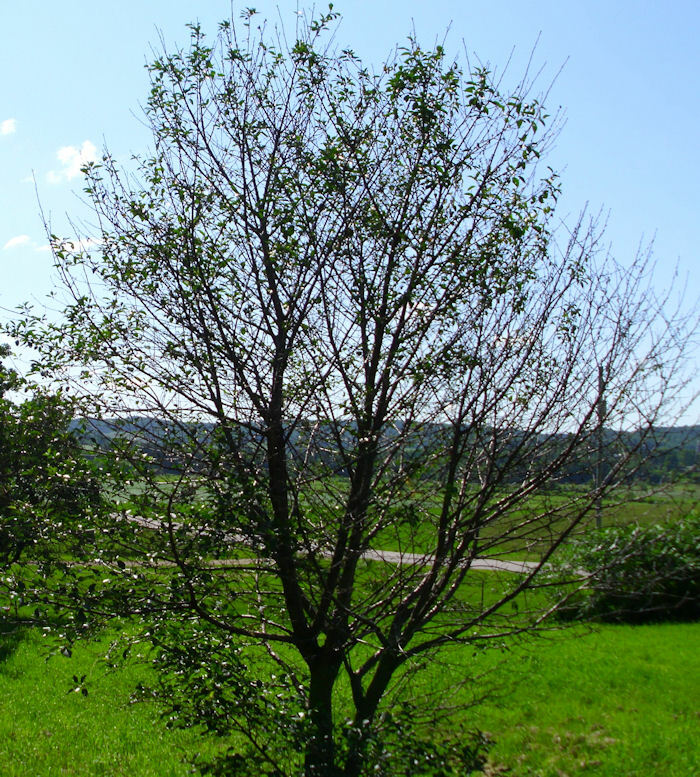 In both cases, the trees have left their diseases in the ground. If I plant new trees in these locations, they’ll immediately become infected. Consequently, I’ll be looking for a new type of cherry (or cherries) and a completely different location next year. One major lesson I’ve learned is that trees of the prunus genus require significantly more care than either apples or pears. This spot will be taken over by butternut trees next year. We don’t have any butternut trees in our woods (they can grow in the wild), so the addition of nut trees will be nice. I know that our woods do contain hickory nuts and plan to gather as many as I can this next fall (as soon as I identify precisely where the trees are located). What are your favorite sorts of nuts and fruits? Let me know at John@JohnMuellerBooks.com.